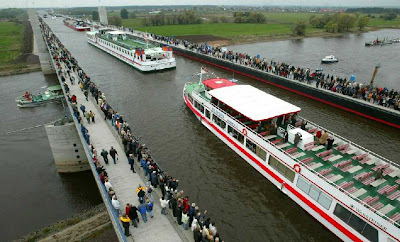 Water Bridge in Germany.Six years, 500 million Euros, 91 8 mete rs long.This is a channel-bridge over the River Elbe and joins the former East and West Germany,as part of the unification project. It is located in the city of Magdeburg, near Berlin. The photo was taken on the day of inauguration.